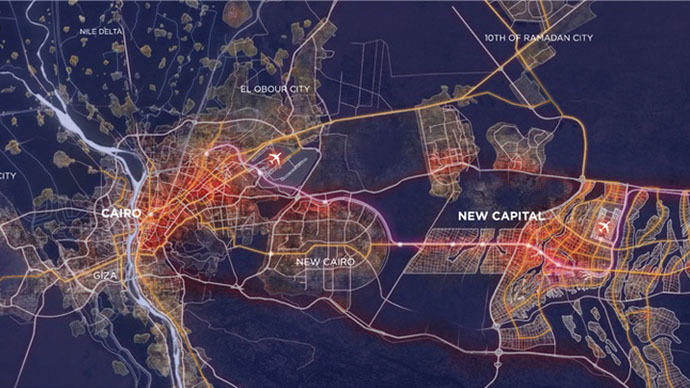 Egypt has published official plans for a brand new capital city, located next to Cairo, which it says will be constructed with investment from Gulf states. The new city, which will house five million people, is expected to be built in under seven years. “We are talking about a world capital,” housing minister Mustafa Kamel Madbouli said during a press event at Sharm-el-Sheikh, where the country is staging a high-profile investment conference. "The idea to build the new city originated from our awareness that Cairo's current population, 18 million, will double in the next 40 years." While government officials have voiced conflicting figures on details of the development, the official website of the city – simply named 'The Capital' – shows plans for a theme park seven times bigger than California's Disneyland, an inner-city airport larger than Heathrow, and 40,000 hotel rooms. The 700 square kilometer city will be about the size of Singapore. The project will be led by self-made UAE billionaire Mohammed Alabbar, whose company built the Burj Khalifa, the world’s tallest building, in Dubai, and is constructing an even more expensive megapolis, the King Abdullah Economic City, in Saudi Arabia. "It is a wonderful opportunity to be able to design something from scratch, and to design it keeping in mind the needs of the Egyptian people and the Egyptian government," Alabbar told the BBC, promising that the new development will be a source of “national pride” for Egypt’s 80-million strong population. Alabbar’s Capital City Partners group has promised that the new city will be “sustainable,” with 90 square kilometers of solar panels and an electric railway connecting it with the current Egyptian capital. Plans to move the government, embassies and business headquarters out of the polluted and crowded Cairo first surfaced last year, and earlier this month investment minister Ashraf Salman divulged more details, saying the government would “incur zero cost” in the project, which is now valued at about US$45 billion. Salman predicted that the development would take 12 years, but Madbouli said the city would be complete in five to seven years, which would require a torrid pace of construction. The announcement of the city plans at Sharm-el-Sheikh is not a coincidence. The conference has been a means for the government of Abdel-Fattah el-Sisi to forge ties, not just with Western investors and politicians – John Kerry headed the US delegation – but also with Gulf states. The region’s desert kingdoms pledged a collective $12.5 billion to the Egyptian state, alongside plans for a new capital. "The aim is to put Egypt back on the map of international investment, and send a message to the world that the country is safe and attractive," said International Cooperation Minister Naglaa al-Ahwani at the event. Egypt suffered a collapse of its tourism industry following the Arab Spring of 2011 and the instability that accompanied the removal of long-time leader Hosni Mubarak and the tumultuous leadership of the Muslim Brotherhood. Growth has been at a sluggish two percent per annum since 2011, with the IMF predicting an increase to 4.3 percent per year in 2015-16. With a rapidly expanding population, Egypt’s GDP per capita currently sits outside the top 100 countries in the world.